As an honorary President of CACCI and the Chairman of the Chinese National Association of Industry and Commerce, which is a primary member of CACCI, I am delighted to have such a large number of CACCI bankers here to discuss matters concerning regional cooperation in Asia and the acceleration of its economic development. If financing and investment are the two main pillars for a rapid economic growth, banking services are surely its corner-stone. Without the active support of bankers, it will be futile talking about the promotion of industry and foreign trade. All economic activities need capital, most of which comes from and through the hands of bankers. Conversely, bankers also depend on a viable economy for their own success. If the economy grows, the business and industrial sectors prosper, there will be an increasing capital demand to finance trade activities and to expand product ion facilities; the business opportunities for bankers will consequently multiply. So, businessmen and bankers actually live in a complementary world. They need each other and their association is mutually beneficial. In Asia, an area of great potential for development, business opportunities for bankers in the l 980’s are immense. Countries like Indonesia, Malaysia, Thailand and the Philippines are endowed with abundant natural resources yet to be explored. Those like India are already highly developed in heavy industries. South Korea, Hong Kong, Singapore, and the Republic of China are now being labelled ”newly industrialized countries,” and Japan, Australia and New Zealand, have long been leading developed countries in the world. As to the remaining countries, most of them are striving wholeheartedly for economic growth and the improvement of people’s livelihood. One can easily visualize Asia’s immense fund requirements needed for development in the coming decade. Asian bankers, and bankers throughout the world, therefore, should coordinate their efforts and financial resources to meet the anticipated challenges of the 1980’s. Take, for example, the Republic of China: Our economic growth rate for the first half of 1981 was 5.4%. Our foreign trade for the first three quarters of the year totaled US$16.2 billion for imports and US$16.7 billion for exports. These figures represented, respectively, a growth rate of 9.9% and 16.3% over the corresponding period in 1980. Although generally speaking, the world economy has remained stagnant, we are fortunately still able to maintain a sustained growth rate. In addition to the satisfactory performance of the private sector, our government, after completing our ten major infrastructure projects in the 1970’s, has launched another twelve new construction projects, comparable in magnitude to the ten already completed. Four of these projects are for the improvement of railway and highway transport; one for nuclear installations; one for the expansion of Taichung Harbor; one for the expansion of the China Steel Mill; while the others are for the improvement of irrigation and for community development. The total fund requirements for these twelve projects, which are scheduled to be completed over a period of six years, amount to over US$7 billion. Our government of course will provide a major portion of the funds required for these projects, but still a considerable amount will have to come from foreign financing. In Taipei, we have, at present, a total of 23 foreign banks: 19 Western and 4 Asian. I am sure we welcome more foreign banks to set up their branches here to facilitate bilateral trade relations and to invest in the construction projects of our country. On behalf of the business community in the Republic of China, I extend to you a cordial invitation to participate in our economic development in the years ahead. Wishing this meeting every success. Thank you. In behalf of CACCI – Confederation of Asian Chambers of Commerce and Industry – I take great pleasure in extending you all a hearty, sincere welcome. I would also like to take this opportunity to thank you for taking time out of your busy schedules to attend this meeting, especially those of you who have come a long way from other countries and areas. This meeting is sponsored by CACCI. Because of the rapid economic development in Asia in the l960’s, the business leaders in the region felt the growing need for a confederation of their own chambers to strengthen regional cooperation in commerce and industry. The Republic of China was one of the founders of CACCI. 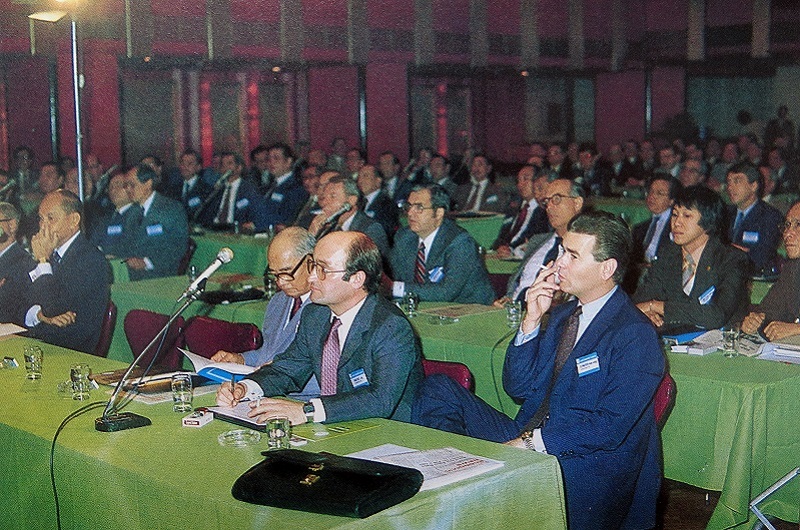 As a matter of fact, the first CACCI Conference was held here in Taipei in 1966, marking the beginning of a non – governmental regional organization dedicated to the promotion of prosperity and well-being of the region. The geographical coverage of CACCI corresponds with that of the ESCAP – Economic and Social Commission for Asia and the Pacific – which is the regional organization of the United Nations. The purpose of our Council is to provide a regular forum for all bankers in Asia to exchange views and information on banking activities in Asia. It also provides an opportunity for them to get acquainted with each other and to develop a bond of fellowship among themselves which hitherto may not have existed. We hope that through such personal relationships, Asian bankers could do more for the businesses and industries in the region, either through syndication or other banking and financing services, thus helping accelerate economic development in all Asian countries. The Asian Bankers Council, as we visualize it, will be a rather liberally organized institution. There shall be no rigid restrictions on membership, and the membership shall be open to all. It shall be a spontaneous regional organization with no government interference. Nor shall it be dominated by any country or any leading bank. It shall strictly be an open forum for all members. Hopefully, our meetings in the future will be rotated among Asian countries so that we can have more exposure to the socio-economic development in all countries. Another feature of this organization is that it will be affiliated with the Confederation of Asian Chambers of Commerce and Industry. We must realize that the main business scope of all banks is to service commerce and industry. Our affiliation with CACCI will enable us to have dialogue with the business leaders of all Asian countries and have a direct feel of the economic pulse of the region, so to speak. As a banker myself, I know the traditions, taboos, and the code of conduct of bankers. We bankers like to keep many of our social and business functions to ourselves. We have our own conventions, our own associations, and our own exclusive clubs. By being members of the Asian Bankers Council, we will have ample opportunities to meet with business and industrial leaders to work together for the common goal of promoting Asian well-being and prosperity. In the l 970’s Asian economy achieved spectacular growths. The developed countries in the region have become significant economic powers in the world. Many developing countries were already at the threshold of becoming developed countries. I believe the dynamism and importance of Asia will continue into the l980’s. This will be a golden opportunity for us bankers to play an increasingly meaningful role in providing financial services to the businesses and industries so that the investment and development needs of Asia can be met. The Asian Bankers Council will be our vehicle to coordinate our efforts and work together toward this end. Although our focus is on Asia, we have invited bankers from all parts of the world who have a business interest in Asia, to join us. United, we will have the financial might of the world to back us. We will be able to help shape the economic future of Asia, and I think I am not exaggerating in saying this. There have been reports that the World Bank may undergo a major policy change by cutting back sharply on aid programs for the poorest countries and putting an end to public financing of so­ called hard loans to middle-income developing countries. Very possibly, a large number of Asian nations will be ”graduated ” out of the lending system of the World Bank and will have to look for other sources to finance their development projects. I think private bankers in Asia can rightfully fill in the void left by the World Bank by putting up funds for these development projects through syndications or consortia. This is another possible area that the Asian Bankers Council can explore and work on in the future. Looking ahead into the l 980’s, I can see there is a growing tendency for more nations to align themselves into economic blocs to accelerate regional prosperity. 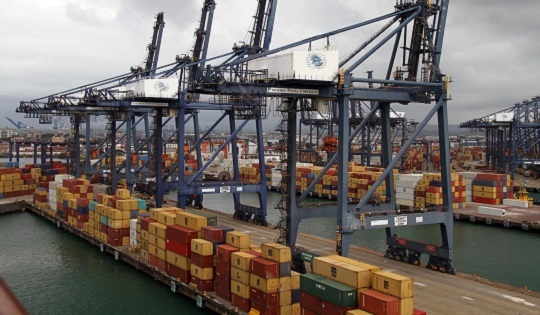 Eventually, Asian countries will come to the realization that there should be an Asian Economic Community to promote regional trade and economic development. Given the heterogeneity of cultures and languages in Asia, we can visualize there will be constraints and difficulties in establishing an economic community on an Asia-wide basis, but in the long run, we must compromise our differences in order to achieve a certain form of regional solidarity to withstand pressures from other economic blocs. 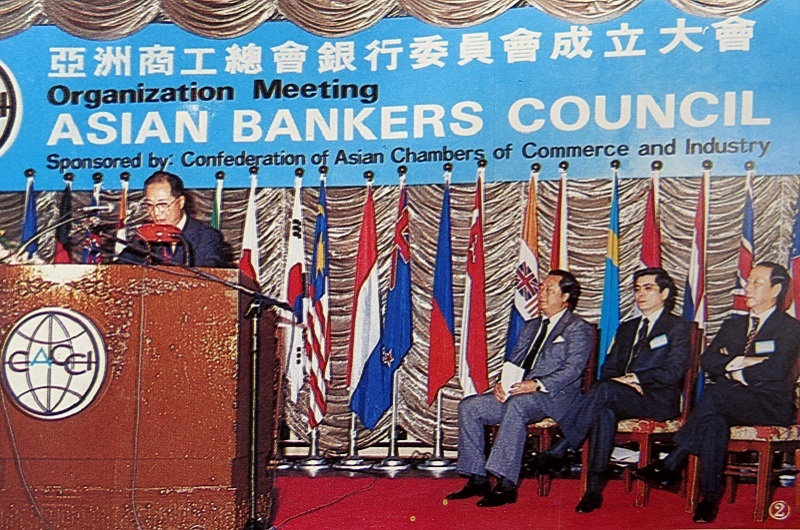 I hope the Asian Bankers Council will be the forerunner for greater Asian solidarity and cooperation. If Asian bankers can work together for the common cause of Asian prosperity, there will be a general awakening among Asian nations for increasing regional cooperation in many other economic activities. I thank you again for your attend ance and support . Ihope the theme of this meet ing, Banking Opportunities in Asia, will be helpful and informative to all of us. Ialso hope that your stay in my country will be pleasant and enjoyable. 207 Asian bankers from 139 banks (including foreign banks) attended the first Organisation Meeting of the Asian Bankers Council in Taipei, Taiwan, R.O.C. on October 27-30, 1981. The countries represented were Australia, Republic of China, India, Indonesia, Hong Kong, Japan, Republic of Korea, New Zealand, Malaysia, Philippines, Thailand and Singapore. The Opening Session of the Organisation Meeting of the Asian Bankers Council started with an Opening Address by Mr. Jeffrey L.S. Koo, President of CACCI, and President of China Investment and Trust Co. Mr. Koo stated that since the World Bank was reportedly poised to cut aid for the developing countries, and rely more on private lending, bankers in Asia in particular will play a greater role in the development of the region. The full text of his speech is reproduced in Annexure I. Following Mr. Koo’s opening address, Dr. Chen Fu Koo, Chairman of the Chinese National Association of Industry and Commerce, and Honorary President of CACCI, in a Welcome Address to participants, predicted immense business opportunities and fund requirement s for the development of Asia in the 1980’s. He urged bankers in the region to ·coordinate their efforts and financial resources to meet the anticipated challenges. The full text of his address is contained in Annexure II. Dr. I.S. Sun, Chairman of the Bankers Association of Taipei, in his Welcome Address, outlined the R.O.C.’s banking system s and policies, and stressed the need for international cooperation for any country to achieve sustained economic growth. Full text of his speech is reproduced in Annexure III. The Keynote Address at the Opening Session was made by Governor Kuo-Hwa Yu of Central Bank of China. He welcomed the formation of an Asian Bankers Council as a vehicle for financing and promoting trade and investments among Asian countries. He pointed out that the banking industry plays a very vital role in achieving a country’s external and internal trade balance. Full text of Governor Yu’s speech is contained in Annexure IV. His Excellency Sun Yun-suan, Prime Minister of R .O.C., speaking at a Reception for ABC participants hosted by Mr. C. C. Chang, Minister of Finance of R.O.C. on Tuesday, 27th October , 1981, disclosed that the government of R.O.C. is taking pragmatic steps to encourage foreign investment and the transfer of capital and technology, both very much needed in developing the nation’s economy. He stated that the government is also considering the partial admission of foreign investors into the local stock market. Full text of the Prime Minister’s speech is contained in Annexure V.
Mr. Aurelio Periquet, Jr., Immediate Past President of CACCI, also graced the occasion. He was seated at the center stage with Mr. Ronald H.C. Ho, CACCI Convener of the Asian Bankers Council and all the opening speakers. 1. The Asian Bankers Council is sponsored by the Confederation of Asian Chambers of Commerce and Industry (CACCI) as a forum for regional economic cooperation and interaction in the banking and financing field. To undertake such projects as will serve trade, industrial and investment cooperation and development in Asia and Australasia. 1. Banks and other financial institutions, both private and government-owned, in Asia and Australasia are welcome to join the Asian Bankers Council as members. 2. Banks and other financial institutions, both private and government-owned, of other regions which have a presence in Asia or Australasia are also welcome to join the Asian Bankers Council as members. 3. Membership shall be effective upon approval by the Board of Directors. 4. All the participating banks and other financial institutions, except observers and guests, at the Organization Meeting of the Asian Bankers Council will be automatically members, subject to their written* consent. 5. A member may at any time withdraw in writing to the Secretariat. The withdrawal shall be effective upon receipt by the Secretariat of such withdrawal notice. 1. The affairs of the Asian Bankers Council shall be governed by the Board of Directors which may be referred to as the ”Board. 2. The Board shall be composed of 9 to 15 directors elected by the members at the General Meeting. For any position falling vacant between two General Meetings, the Board of Directors may co-opt, upon recommendation by the Chairman, a new member to the Board. 3. The Board shall elect from among themselves a Chairman and a Vice Chairman who shall serve for a term of two years. At the expiration of term of the Chairman, the Vice Chairman shall automatically become Chairman. 4. For providing staff function and for the sake of continuation of the work of the Asian Bankers Council, the secretariat function shall be delegated to the Permanent Secretariat of CACCI, with the Director-General of CACCI as the concurrent Secretary-Treasurer of the Council. adopt rules and procedures for the conduct of Board Meeting and General Meeting. 6. The Board shall meet at least once a year. No less than thirty days notice of the Board Meeting shall be given. 7. The Board may decide matters by mail ballots without calling a meeting. 1. The General Meeting shall be held at least once every two years. No less than sixty-days notice of the General Meeting shall be given to all members. 2. The date of General Meeting shall be determined by the Board of Directors in consultation with the host country. The place of a General Meeting shall be determined at the proceeding General Meeting. 3. Observers and guests may attend the General Meeting upon approval of their applications by the Chairman, or by invitation. 1. This Charter or any amendment thereof shall take effect upon approval by the majority of all members present at the General Meeting. *The word “written” was inserted as an amendment adopted at the Organisation Meeting, Asian Banker Council, October 29, 1981. Chief Representative in Hong Kong representing Australia & New Zealand Banking Group Ltd.
1. 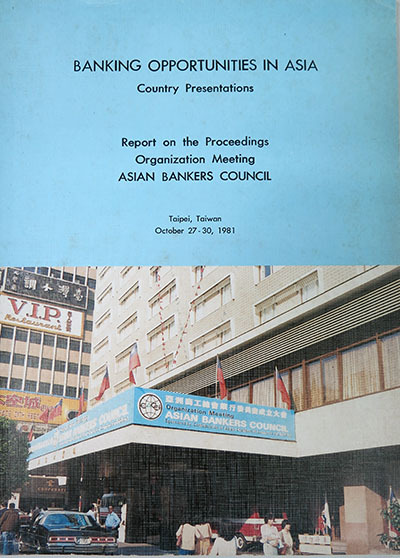 Over 207 bankers in the region meeting in Taipei, Taiwan, on October 27-29, 1981, approved the organization of an Asian Bankers Council and discussed the banking opportunities that exist in the countries of the area. One hundred and thirty nine (139) banks (including foreign banks from 12 countries) operating in the following countries of Asia and Australasia were represented: Australia, Republic of China, India, Indonesia, Hongkong, Japan, Republic of Korea, New Zealand, Malaysia, Philippines, Thailand and Singapore. 3. Dr. Chen-fu Koo, Chairman of the Chinese National Association of Industry and Commerce, a primary member of CACCI and co-host to the meeting, welcomed the delegates and emphasized the need for Asian bankers to coordinate their efforts and financial resources to meet the region’s immense fund requirement s for economic growth. 4. Dr. I.S. Sun, Chairman of the Bankers Association of Taipei, while welcoming delegates to Taipei, outlined the ROC’s banking systems and policies, and stressed the need for international cooperation for achieving sustained economic growth. 5. Governor Kuo-hwa Yu of Central Bank of China made the keynote speech at the meeting and welcomed the formation of an Asian Bankers Council as a vehicle for financing and promoting trade and investment among Asian Bankers Council as a vehicle for financing and promoting trade and investment among Asian countries. He pointed out that the banking industry plays a very vital role in achieving a country’s external and internal trade balance, which is crucial to economic development. 6. A general discussion on “Banking Opportunities in Asia” was held after representatives from different areas reported on financial and banking conditions in their respective countries. It was presided by Mr. Ronald H.C. Ho, Convener of the Asian Bankers Council meeting, who expressed the hope that bankers will be able to improve their services to meet the challenges of the dynamic growth of the region. to undertake such projects as will serve trade, industrial and investment cooperation and development. The bankers also agreed that various committees be created and assigned by country to study and suggest measures that would implement the objectives and purposes of the Asian Bankers Council. 9. 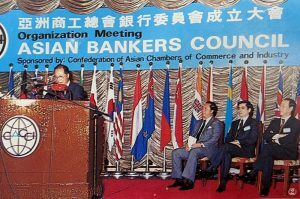 The Council agreed to hold the next General Meeting of the Asian Bankers Council in Manila, either in 1982 or 1983.
requirements for foreign banks to set up branch or office in each country. 11. 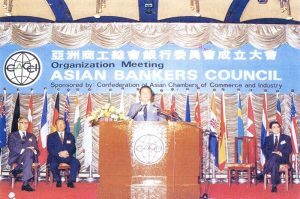 The meeting ended with profuse thanks to the Convener and hosts, the Confederation of Asian Chambers of Commerce and Industry (CACCI), the Chinese National Association of Industry and Commerce, the Bankers Association of Taipei, the Government of the Republic of China and all those who gave their unqualified support to the meeting and the formation of the Asian Bankers Council.